The internet has changed the way we do business, communicate, and earn an education. While many of the same foundational educational principles apply both on-campus and online, there are certain specialized skills necessary for teaching courses through the internet. Those interested in teaching distance learning courses may consider pursuing an online master's in education. Furthering your education represents an investment in your future, and a master's degree can pay off for online educators. Teachers with a master's degree regularly earn $11,000 more annually than their peers with only a bachelor's degree. Earning a master of arts in teaching online may also make you eligible for administrative positions within your school or district, further increasing your salary potential as your career progresses. Many of the classes in a master's in education online program resemble those you may have taken during your undergraduate program. However, at the master's level, classes go more in-depth and cover specific topics, such as using online learning platforms. You may also be required to conduct research. When researching online programs, pay close attention to which specializations different universities offer. If you aspire to work as a principal, you may want to specialize in educational leadership. Other specializations include special education and curriculum development. University of Missouri ranks #1 on The 9 Best Online Master's in Online Teaching Programs! Offering more than 100 web-based degrees and certificates through its Mizzou Online program, the University of Missouri-Columbia has earned a reputation as one of distance education's strongest advocates. In addition to making higher education convenient, academically rigorous, and affordable, Mizzou Online gives students the chance to improve and enhance the digital learning experience through its online master's in learning technologies and design. This 30-credit program's unique emphasis on web and application design prepares students for careers in the creation and implementation of online learning platforms, educational games, and online curricula. Graduates go on to pursue roles in a variety of professional fields that utilize online education services, including healthcare, the military, and K-12 education. Required coursework introduces the crucial concepts and skills involved in online learning program and instructional materials design, as well as methodologies used in teaching online courses. In addition, students must select two exploratory courses covering web-based learning platforms such as Moodle, Blackboard, Schoology, or Canvas. In addition to 18 hours of core coursework, students complete 12 hours of elective courses. Mizzou Online's diverse series of electives includes classes in grant writing, mobile web app development, history of books and media, and formative and summative evaluation. A capstone course must be completed prior to graduation. All courses are eight or 16 weeks in length, and available entirely online. Most students take one to two classes each semester and complete the program in around two years. Interested applicants should hold a bachelor's degree from a regionally accredited school and have earned at least a 3.0 GPA during the last 60 hours of their undergraduate coursework. GRE scores are not required. All distance learners quality for University of Missouri's in-state tuition. University of Missouri is regionally accredited by Higher Learning Commision. The College of Education is part of the Teacher Education Accreditation Council. University of Rochester ranks #2 on The 9 Best Online Master's in Online Teaching Programs! Located on the shores of Lake Ontario, this New York research university has long been at the forefront of educational innovation. The University of Rochester's MS in online teaching and learning, offered through its Warner School of Education, is no different. Preparing students for careers in teaching through web-based platforms, it offers a cutting-edge perspective on the design and development of distance learning experiences. Requiring 33 credit hours, the program includes 15 hours of elective coursework and a three-credit field experience. Core classes cover the fundamentals of online teaching and learning, designing online courses, and research methods for master's students. Elective course offerings are varied, and address topics such as entrepreneurial skills for educators and literacy learning, while others let students concentrate on online instruction for particular subjects, such as English or science. Those interested may also earn an advanced certificate in online teaching, which requires an additional 15 hours of coursework, three of which consist of an experiential learning period in the field of their choosing. While this highly flexible curriculum lets students tailor their graduate education to meet personal and professional goals, some associated classes are only offered every other year. Applicants should possess some prior experience teaching in their area of interest, whether through professional or volunteer work. GRE scores are not required. Distance learners are not offered in-state tuition, but the program does offer a limited number of institutional scholarships. Currently, the University of Rochester's online master's program is not available to distance learners living in Delaware, Utah, and Wisconsin. University of Rochester is regionally accredited by the National Council for Accreditation of Teacher Education. 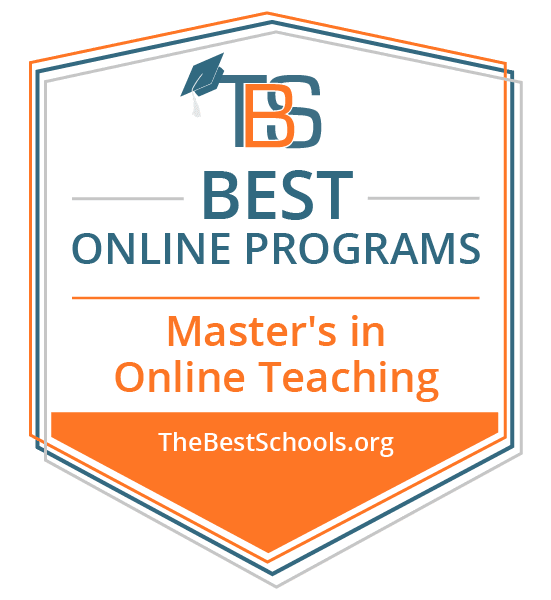 Dallas Baptist University ranks #3 on The 9 Best Online Master's in Online Teaching Programs! Based just 13 miles from downtown Dallas, this Baptist university offers 59 fully-online degree programs in a range of academic fields. DBU seeks to replicate the same sense of community and dedication to Christian principles in its online programs that it strives to foster on campus. Designed to give working professionals a flexible alternative to traditional degree programs, DBU's web-based courses are available year-round. While students pursuing a MA in teaching with a distance learning specialization won't gain a Texas teacher certification, they will develop a solid knowledge base in the fundamental principles of distance learning; gaining insight into the use of technology in the online classroom. This 36-credit program includes 15 hours of specialized major coursework, through which students explore theories in instructional supervision and curriculum design and evaluation, as well as resource areas such as teaching methodologies for a multicultural society and ESL instruction. While all classes are taught online, the program includes a field based service-learning component. Online masters students may also count their academic work toward grade- and subject- specific certifications. Due to an increase in popularity, online students are encouraged to register for courses early. Applicants must possess satisfactory GRE scores as well as a bachelor's degree from a regionally accredited university. In addition to these requirements, DBU expects all applicants to demonstrate a strong sense of moral character through two letters of recommendation and a personal statement of purpose. Dallas Baptist University is regionally accredited by the Southern Association of Colleges and Schools Commision on Colleges. Wilkes University ranks #5 on The 9 Best Online Master's in Online Teaching Programs! Thanks to its policy of charging the same tuition rate for state residents and nonresidents alike, this Pennsylvania school has earned a well-deserved reputation for affordability as well as academic quality. The university's master's in online teaching with Pennsylvania Online Instruction Endorsement prepares educators for careers in education, focusing on how to design, manage, and assess digital learning environments. Graduates who possess a valid Pennsylvania teaching license automatically qualify for an embedded Pennsylvania online instruction endorsement. Students pursuing a master of science in education with a major in online teaching through Wilkes can take advantage of seven- or eight-week accelerated courses, taking one course at a time while completing two courses per semester. Most finish the 30-credit program in around two years. Major course offerings offer in-depth instruction in popular assessment technology, the use of emerging technologies for learning improvement, facilitating online learning communities, and social and ethical issues in online learning.The program concludes with a course on teaching and learning in the online environment. A few mandatory courses are offered through a partner program, PLS 3rd Learning, and require separate registration and payments. Applicants do not need to take the GRE, but must submit two letters of recommendation and possess a bachelor's degree from an accredited institution. Students seeking the embedded Pennsylvania online instruction endorsement must also submit a copy of their Pennsylvania level I or II teaching certificate. Qualified applicants can apply for financial aid. Wilkes University is regionally accredited by the Middle States Commission on Higher Education. Madonna University ranks among The 9 Best Online Master's in Online Teaching Programs! Founded in 1937 by Mother Mary DeSales Tocka, this Livonia, Michigan-based Catholic institution has additional campuses across the state. Madonna University takes pride in its low student-to-teacher ratios, affordable tuition rates, and educational outreach centers serving disadvantaged individuals throughout Michigan. Madonna is also home to a unique sign language studies program, and serves as an ASL state interpreter test site. Madonna's MAT in online teaching and eLearning offers current educators the hands-on skills required to design and implement online learning courses across a range of educational contexts. The online master's in education is comprised of 30 hours of coursework, including core classes in comparative and international educational perspectives, media production for online instruction, studies in diversity and global communities, and the legal and ethical aspects of online learning. The program culminates in an online practicum, in which students design and implement their own online curriculum. Students who earn a master's in online teaching go on to pursue careers in higher education, corporate training, and online teaching, and work in settings that include colleges, high schools, and private corporations. Applicants do to not need to submit GRE scores, but must supply a personal statement of purpose and a letter of recommendation. Distance learners can take advantage of numerous merit- and need-based scholarships, grants, and affiliation awards available to Madonna students. Madonna University is regionally accredited by the Higher Learning Commission (HLC). New Mexico State University ranks among The 9 Best Online Master's in Online Teaching Programs! Based in Las Cruces, New Mexico State University holds the distinction of being the first honors college in the state, and prides itself on serving a diverse student population. The school's MEd with a graduate certificate in online teaching and learning program is intended for current or prospective K-12 educators who wish to take on instructional roles in online and blended learning courses. The program holds particular appeal for current New Mexico educators who already possess a state teaching licence, as they will advance to the third tier in New Mexico's three-tiered licensure system upon graduation; a distinction that assures a base salary of $50,000. Delivered entirely online, the master's in education online curriculum consists of 36 total hours of coursework; 18 of which center upon general topics in education. An additional 15 hours address concepts specific to online learning and teaching, such as web-based multicultural education, critical digital literacy, the design and organization of online learning environments, and online teaching and learning assessment. Students can choose to complete the program in two or three years, with those who work full-time taking a summer semester in addition to abbreviated fall and spring schedules. All students must take a comprehensive examination prior to graduation. New Mexico State University is accredited by the Higher Learning Commission. The school's Masters in Education is specially accredited by the Council for the accreditation of Educator Preparation. Thomas Edison State University ranks among The 9 Best Online Master's in Online Teaching Programs! With an average student age of 35, this Trenton, New Jersey university is known for its pioneering role in providing higher education to adult students, as well as being one of the first schools in the country to utilize distance learning programs. There's no doubt that Thomas Edison State University is uniquely qualified to offer a web-based MA in liberal studies and online learning and teaching. Focusing on the relationship between the liberal arts and distance learning methodologies, this online masters program provides students with a solid theoretical foundation in pedagogy, as well as the skills required to effectively teach in the virtual classroom. Requiring 36 credit hours of coursework over six terms of study, the MA program includes 18 hours of core liberal arts classes that address topics in philosophy, ethics, art, and technology. In addition, students must complete 12 hours of concentration-specific coursework. Exploring the theory and culture of online learning, communication and interactivity, and instructional design, these courses culminate in a six-hour hands-on capstone project, through which students demonstrate their mastery of the subject matter. The majority of distance learners earn their degree in two years or less. Applicants are not required to provide their GRE scores, but should hold a bachelor's degree from a regionally accredited institution, along with some professional or volunteer experience in the field of online instruction. In addition, prospective students should submit professional references and a personal essay along with their application. Thomas Edison State University is regionally accredited by Middle State Commission on Higher Education. California State University, East Bay ranks among The 9 Best Online Master's in Online Teaching Programs! Dedicated to making higher education accessible for working professionals, California State University-East Bay offers 35 fully-online degree and certificate programs, including nine graduate degrees. Presented in a unique asynchronous format, CSUEB's MS in education with online teaching and learning option is designed for current educators who want to explore the field of online education and technology, or branch out into online teaching jobs. A flexible schedule lets students take as many classes per quarter as they wish, and even skip a quarter if necessary. Although the program as a whole is self-paced, each course requires weekly assignments and threaded discussions. The program's 30-credit curriculum includes two electives and eight required courses in areas such as the history and culture of online learning communities and technological tools in online instruction. Topics addressed through elective coursework include online content development, educational interface design, and current issues in online teaching. Students are also required to complete a 15-week capstone project. Because the school is transitioning into a semester-based program in fall of 2018, future course offerings are temporarily unavailable. Applicants should hold a bachelor's degree from an accredited university, and have some background in teaching, training, or HR development. In addition to official transcripts, prospective students should submit a letter of intent to the program director. California State University-East Bay is regionally accredited by the Western Association of Schools and Colleges. An online master's in education opens up many unique career paths. Master's degree holders are leaders in the field of education, whether they work in the classroom or the district office. The careers below are only a few of the possible jobs you may apply to depending on your specialization. Special Education Teacher: Special education teachers work to ensure that students with disabilities receive a quality education. They keep track of their students' Individualized Education Plans (IEPs) and work with other teachers so that students receive accommodations in the general education classroom. Throughout the year, they hold conferences with parents, students, and teachers to review students' IEP progress. Instructional Coordinator: Instructional coordinators develop curriculums and instructional material. A district may employ several coordinators, one for each subject area. Instructional coordinators also work one-on-one with teachers and lead professional development seminars. In addition to a master's degree, most instructional coordinators have many years of teaching experience. Speech-Language Pathologist: Speech-language pathologists help students overcome speech disorders such as Tourette Syndrome or lisping. Within their districts, speech-language pathologists travel between schools to work with students one-on-one or in small groups. They often meet with teachers and parents to discuss students' treatment and progress.